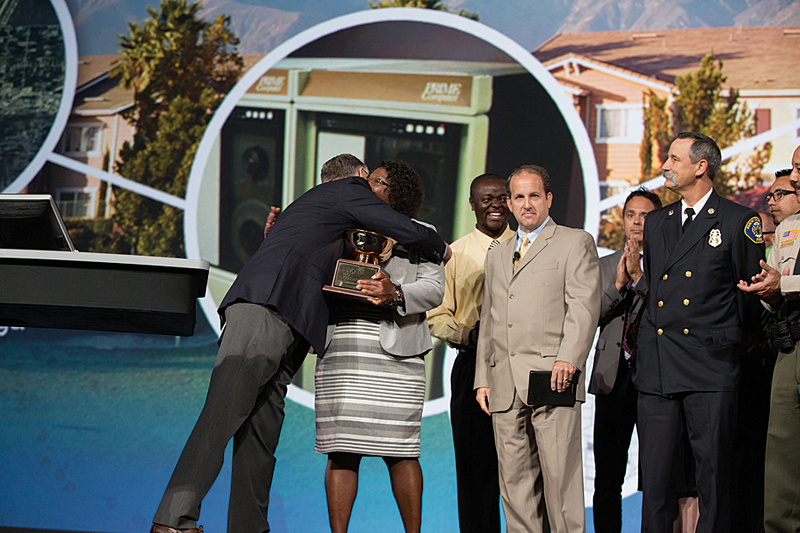 At the 2014 Esri User Conference, the City of Rancho Cucamonga, California, received the Esri President’s Award for its outstanding GIS work in planning a sustainable community and its innovative uses of GIS throughout the city. Members of the City of Rancho Cucamonga, California, city government accepting the Esri President's Award for the city's outstanding GIS work. From left to right, Esri president Jack Dangermond; Ingrid Bruce, GIS/special districts manager; Solomon Nimako, senior GIS analyst; John Gillison, city manager; Chris Bopko, management analyst; and Mike Bell, former fire chief. Incorporated in 1977, the city began using GIS in 1985 to better deliver services to its residents and preserve the area’s rural, historic character. The exemplary work for which the city was honored was made possible because it adopted an enterprise implementation of GIS. The move to this more systematic use of GIS for the city of 171,000 was primarily due to the GIS division’s position within the Rancho Cucamonga city government and its staff’s dedication over those years. The GIS division is under the Administrative Service Department. This places the division in a central position to support every department in the city. The city’s senior GIS analyst, Solomon Nimako, leads the GIS division in its deployment of solutions to city departments. Nimako has been using GIS for more than 19 years. He carried out his first GIS project while still in high school in Ghana. He used ArcView GIS to plot all government schools in Ghana. It was a summer project and he loved it. Nimako went on to get a BSc in geodetic engineering from Kwame Nkrumah University of Science and Technology in Ghana and a master’s degree in GIS from the University of Redlands, California, in 2005. The next year, he began working at Rancho Cucamonga and, in 2008, he became a supervisor. In his current role as a project lead, he identifies new projects across the city’s departments and ensures that existing applications are maintained to meet the expectations of internal clients. The GIS division has 11 full-time staff members. “We do have terrific staff working in our division, and with their support we are able to build new products for our internal clients,” said Nimako. Our philosophy is “a free mind is a creative mind,” and this concept has the full support of Lori Sassoon, deputy city manager in charge of administrative services. Although the city was an early adopter of enterprise GIS, the addition of Nimako to the GIS team helped push the division forward in deploying newer and improving existing solutions. The GIS division was initially placed under the city’s manager’s office. This has been beneficial from a strategic standpoint because it has never been affiliated with a specific department and has been expected to support all departments. This aided the GIS division in evolving the use of GIS at the city. The GIS team works closely with other city departments to improve communication with city residents. 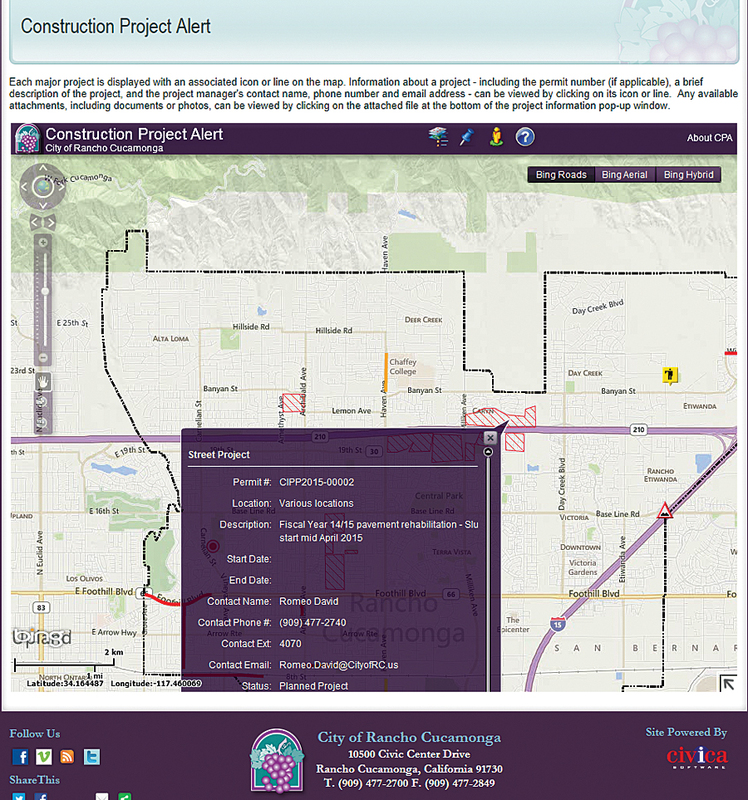 This web map app provides the details of construction projects under way in the city. 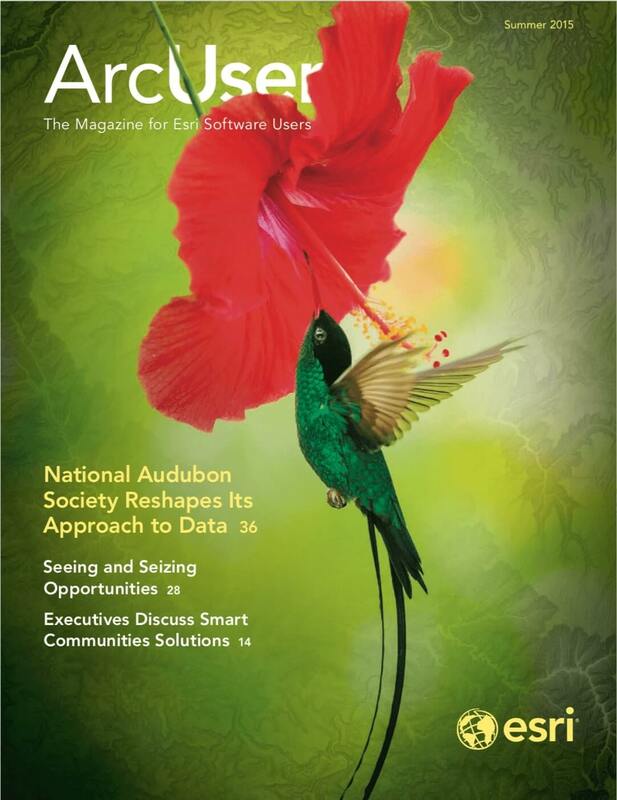 ArcIMS helped with initial efforts to provide GIS services throughout the organization because it required only a browser. Since those early days, ArcGIS for Server, ArcGIS Online, and the apps that come with ArcGIS Online, such as Collector for ArcGIS, have moved services to city departments to the next level. Improvements in GIS technology have expanded the types of things the GIS division can do for departments, but the real challenge in achieving a citywide implementation involved thoroughly understanding the business needs of each department and building rapport with individuals in those departments. His team had to make sure that their internal clients knew that the ultimate goal was to use GIS to streamline processes and make their jobs easier. They also stressed the importance of data collection not only to the overall organization but also for individual departments. Maintaining an open relationship with the IT team enabled the GIS division to effectively communicate its needs. Although the GIS division did not face any major resistance, the IT team did have concerns about security. By taking the time to explain how Esri security works, the IT team gained a better understanding of GIS architecture, and that brought the team into the GIS world a bit. “This really helped in paving the way for us to have access to our servers and the various applications development,” said Nimako. Rafael Balneg, senior GIS analyst, is a lead in the GIS/IS collaboration and manages the division servers, and his role is a key one because he understands and knows the installations and configuration of the Esri applications. ArcGIS Online and the mobile apps made it easy for executive staff to interact with information products. 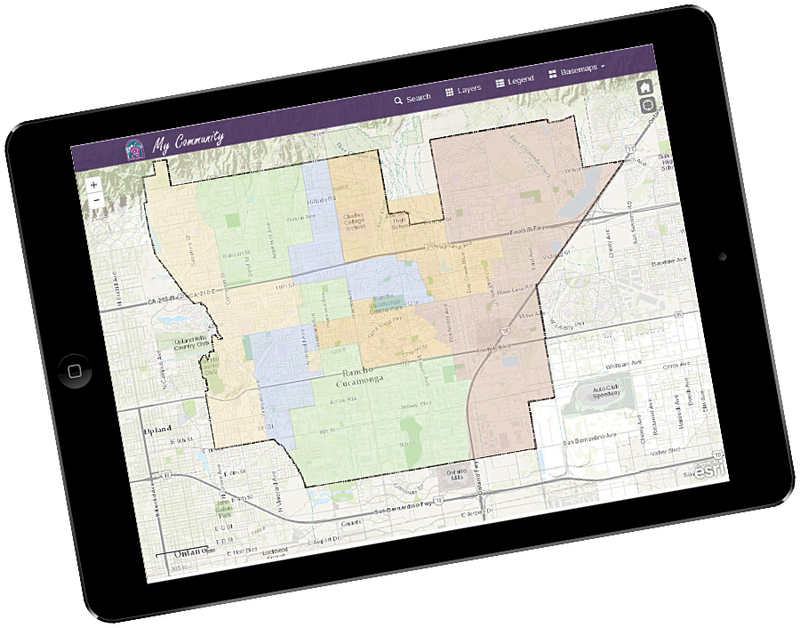 The GIS division was able to transition executives from hard-copy parcel and zoning maps to ArcGIS mobile apps on iPads. It was an easy sell because the products are so accessible and easy to use. Another component of Nimako’s and the GIS team’s success is a concept called the Team of Two. “For any successful enterprise deployment, there needs to be a lead figure and a technical figure working hand in hand,” he explained. Ingrid Bruce, the GIS/special districts manager, helped the team come up with new ideas and solutions that she was able to bring to the forefront on the city’s agenda. GIS maps, such as this one showing trash collection zones, make it easy for residents to get information about city services at any time without calling the city. According to Nimako, understanding the deliverables that are important to stakeholders and decision makers was critical to their success. He believes GIS analysts have to look at things a little differently these days and identify the sensitive and important projects in an organization. “We should look at challenges as opportunities to spread the extensive benefits of GIS,” said Nimako. He uses sidewalk issues as a good example. For local governments, sidewalk issues are a huge financial burden but—for the GIS division—it was an opportunity to build a solution that allows public works staff to quickly identify issues and repair crews to fix them. For three years, the city’s public works team has been doing inspections with the Esri mobile app and this has made the staff very efficient in identifying and repairing sidewalk issues. Residents often call the city manager’s office to find out when their street is going to be repaved. This was another opportunity to address an issue with GIS. By working with the engineering department, the GIS department built an easy-to-use GIS application that lets residents look up this information for themselves. The Executive Dashboard, an internal customized mobile app that runs on both iOS and Android devices, was the brainchild of John Gillison, the city manager, and Mike Costello, the city’s fire chief. It was largely developed and deployed by Ryan Wilson and Isaiah Aguilera, two lead GIS developers for the city. The dashboard provides situational awareness for executives, location and incident analytics for the fire and police departments, an operational view of projects currently being undertaken by the public works department, and the current location of all city vehicles via automatic vehicle location (AVL). To provide a better understanding of the needs of internal customers, GIS team members have ongoing assignments with specific city departments. The GIS team’s close working relationship with the public works department is led by two GIS team technicians, Sopheak Kong and Art Yero. The assignment of GIS technician Vincent Grant to the fire department has enhanced the team’s relationship with the department. Chearice Johnson, another GIS technician, is assigned to maintenance and upkeep of the city’s parcel database. The special districts side of the division manages all special assessment districts in the city and adds annual special taxes and assessments information to the tax roll. GIS is used extensively for the management of the 35 districts. Chris Bopko, management analyst, and Kelly Guerra, special districts technician, are the key staff in this division.